The Directors of Thomas Dane are pleased to present new paintings and works on paper by British artist Hurvin Anderson. Anderson depicts places where people go to relax - country clubs, parks, bars - and identifies a subtle discord beneath their surface. Developing each image from photographs, he builds up pictorial spaces in which echoes of history and personal memory are allowed to emerge through layers of paint. The artist stands at a distance from his subjects, using photographic accounts of particular times and places to trigger reveries and daydreams, from which deeper insights emerge. The beauty of the resulting images immediately strikes the viewer, while their rich subtexts reveal themselves more gradually. 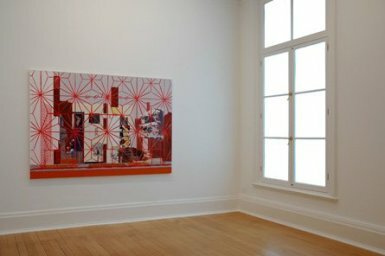 For his exhibition at Thomas Dane, Anderson has produced six paintings on canvas, in addition to a group of works on paper. The canvases are in two veins: those that engage strongly with the tradition of landscape painting and those formed around grids. Of the landscapes, Lower Lake takes an island in the lake of a British urban park as its subject. Memories of a childhood fascination with the island are at play in its floating patches of colour and calligraphic branches. The inaccessible body of land evokes a sense of estrangement, and an identity bound up with a history of colonisation in distant oceans. Welcome: Carib, the last in a group of works called the Welcome series, is structured around the grid of a security grille guarding a West Indian bar. It examines the contradictions inherent in a venue for leisure that simultaneously 'welcomes' visitors and denies entry. This ambivalence is manifested in the grille's decorative quality: as abstract motif, its vibrant geometry unifies the work; as human artefact, it hints at undercurrents of social tension, trouble in paradise. The works on paper function as testing-grounds for both fragments and overall compositions of the accompanying canvases. Whilst rehearsing alternative versions, and thus enriching readings of the larger works, they also attain a unity of their own. Born in Birmingham in 1965 to West Indian parents, Hurvin Anderson studied at Wimbledon College of Art, later attending the Royal College of Art. 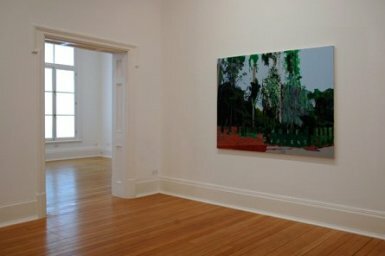 His first solo show, The Lime, was held at David Risley Gallery, London in 2003. In 2004 he was selected by the celebrated German painter Neo Rauch for inclusion in East International, at the Norwich Gallery, and was recently included in Back to Paint at C&M Arts, New York. Shortly, he will take up his position as artist in residence at the Dulwich Picture Gallery.